BE Integrative Design Pte. Ltd.
TELL US MORE ABOUT BE INTEGRATIVE DESIGN. BE Integrative Design Pte Ltd is a member of the “BE Sustainable” group of companies and is inspired by the visionary work of Gunter Pauli. The “BE Sustainable” group of international companies’ combined expertise is synergised in creating positive environmental, social and economic impact. We bring together entrepreneurs and investors and enable them to develop solutions inspired by nature that can be practically and commercially deployed to address our fundamental human needs of water, energy, food, waste, shelter, health, education and employment. Utilising an integrative design approach provides a means to explore and implement sustainable design principles effectively on a project. At the same time, it allows one to stay within budgetary and scheduling constraints. It relies upon a multidisciplinary and collaborative team whose members make decisions together based on a shared vision and a holistic understanding of the project. It follows the design through the entire project life, from pre-design through occupancy and into operation. Singapore has been the test bed for the urbanisation of Asia while being a model of sustainability. As such, being positioned in Singapore in a bid to service Asia and the other emerging regions is strategically a wise move. The high level of infrastructure, ease of doing business, favourable tax rates and government incentives all married with the world class Changi airport makes servicing clients internationally very simple. To transform the design industry through vision and action to a new systems design and thinking approach to our models of development, economy and society. 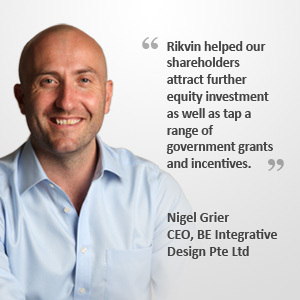 Rikvin was very helpful in assisting the company shareholders to incorporate the company in such a way to be able to attract further equity investment while being eligible for a range of Singapore government grants and incentives.